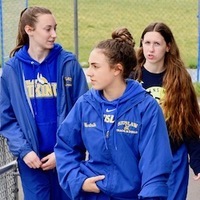 Siuslaw junior Hannah Rannow lowered her own school record in the girls mile Saturday with a second-place finish at the Prefontaine Rotary Invitational in Coos Bay. 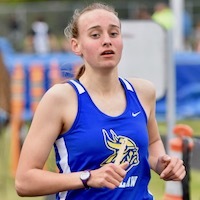 Other top Vikings performers included sophomore Gracie Freudenthal (first in the 100-meter hurdles and second in the 300 hurdles), junior Ryan Rendon-Padilla (second in the javelin) and junior Chloe Madden (third in the 3,000 meters). Rannow, the defending 4A champion in the 800, was second Saturday in a season-best 2 minutes, 25.45a seconds. Rannow finished the Prefontaine Mile — the meet's signature event — in 5:13.44a, eclipsing her previous record of 5:25.55a set in the El Jefe in Eugene on May 25, 2018. Senior Thea Norlund of Arcata, Calif., won in 5:10.68a. Newport senior Leo Johns won the boys Prefontaine Mile in 4:32.99a. Rannow placed seventh in the 2018 Prefontaine Mile, with a time of 5:36.0, which topped a 50-year-old record held by Sherry Wells. Wells ran the mile in 5:38.6 in 1968. Third on Siuslaw's all-time girls mile list is Sharla Nelson at 5:41.8 in 1973, followed by Ruth Bartlett at 5:42.3 in 1975. 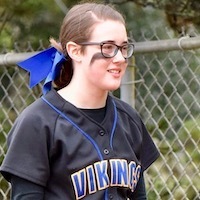 Saturday, sophomore Brea Blankenship placed seventh overall and moved into fifth place on the Siuslaw top 10 with a time of 5:42.58a. Freshman Ryle Colton was ninth in 5:51.61a, which is now seventh all-time for Siuslaw girls. Athletes from 33 schools competed in the meet, which lasted more than nine hours. Prefontaine Rotary Invitational awards — Outstanding throwers: Halle Hargett of Newport and Ty Hampton of North Bend. Outstanding runners: Nyah Kendall of Hidden Valley and Jonathon Chilcote of North Bend. Outstanding jumpers: Chelsea Howard of North Bend and Garrett Hagerty of Hidden Valley. Athletes achieving personal records Saturday at the Prefontaine Rotary Invitational. Tuesday, April 16 — Four-way meet at Siuslaw (Crow, Mapleton, Triangle Lake), 4:30 p.m.